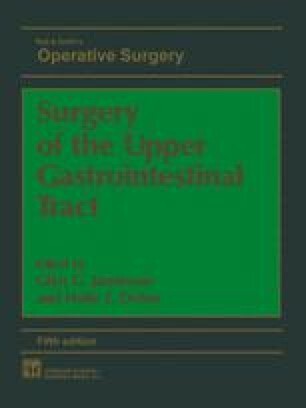 Transabdominal oesophagomyotomy for achalasia was first described in 1914 by Heller, a German surgeon, and involved an extramucosal oesophagomyotomy on both the anterior and posterior walls of the gastrooesophageal junction. Heller’s operation was modified in 1918 by Groeneveldt of Holland who simplified the procedure to a single anterior myotomy. This modification was successfully popularized in continental Europe by Zaaijer in 1923 but its acceptance in the UK and North America took much longer. Numerous modifications of this method have been introduced but an extramucosal myotomy remains the basis of surgical treatment for achalasia.